Click on the link for a copy of this week's email sent home by Principal Borasi. 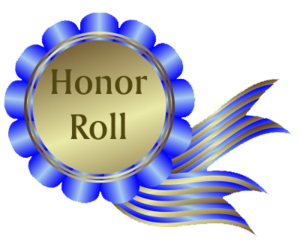 The Riles PTA will be hosting the annual Honor Roll Breakfast on Friday, January 25th from 8:15am-9:30am. 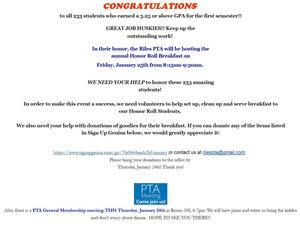 WE NEED YOUR HELP to honor these 233 amazing students! In order to make this event a success, we need volunteers to help set up, clean up and serve breakfast to our Honor Roll Students. or contact us at rilespta@gmail.com. Thursday, January 24th! Thank you! Click here to see the weekly email sent home by Principal Borasi. Interested in taking college classes over the summer at Sac State? Must take the ATS test on February 7th here at Riles @ 8 am. Sign up by February 1st! Get a sign-up sheet in the main office if you are interested! Click here to see a copy of the email sent home to families by Principal Borasi. Interested in attending a Love and Logic parenting course? Please see the two included documents for information on an upcoming parenting course...Love and Logic. Parents - Would you like to feel more confident as a parent? Would you like to have more fun parenting? Would you like to feel more relaxed at the end of the day? Sign up for this seminar and you can learn practical parenting skills that can be used immediately! The following information is required to be shared with all families of CJUSD. This information is required to be distributed by any district that operates a National School Lunch Program. Click here to see the weekly community email from Principal Borasi.